What’s It Like Travelling in a Camper Van in France? – 6/4/12 | Camperissimo! 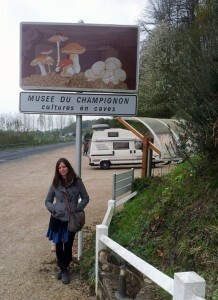 The whole mushroom museum to ourselves! Up to the start of this trip we’d spent something like 60 nights sleeping in the van since buying it back in April 2010. Some of those were weekend trips within Germany, or stopovers in lay-bys on the way to Rijeka and back, but the majority were spent in Romania, Bulgaria, Albania and Montenegro. Until now, those experiences formed the basis of what it meant to us to travel in Camperissimo. In Romania we hardly saw another camper van on the road anywhere in the country, even when we were visiting more popular tourist attractions. On a few occasions In Albania the van drew quite a bit of attention as we drove by, although we may have just been misreading people’s shock at seeing a car not manufactured by Mercedes first hand. In Sofia, a man who’s apartment block we’d parked in front of even came out to greet us personally and find out if we’d slept well in his street. In France things couldn’t be more different, which has been both a positive and a negative thing. No camper van shortage here, nosir. 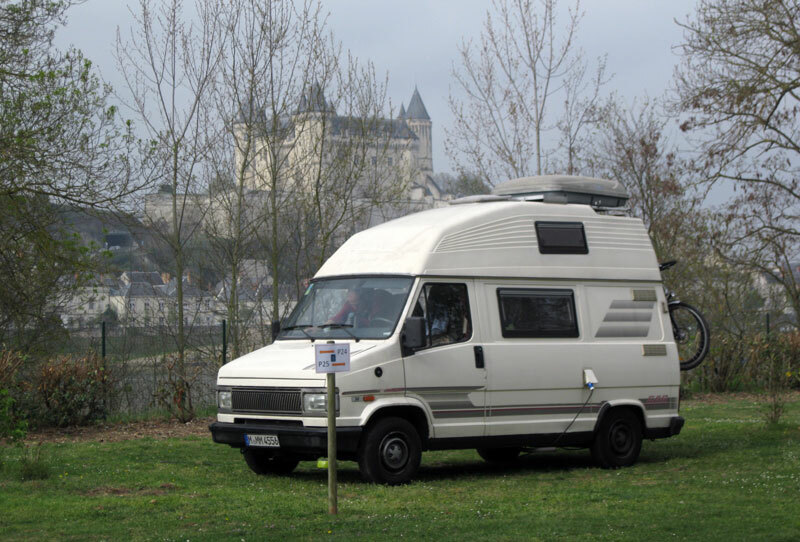 We’ve seen a great deal of campers on the road, the great majority of which are large, French and new-looking, and the towns and attractions we’ve visited so far have almost all made special effort to control the flow of camper van traffic. We first noticed this because of the frequent little blue signs indicating places where camper vans could drain their various water tanks. In most cases that’s literally all there was: a parking space angled towards a central drain, in some cases with the chance to fill up with fresh water. In Sully-sur-Loire there were signs pretty much everywhere prohibiting camper van parking after 21:00 and before 08:00, i.e. piss off and sleep somewhere else. 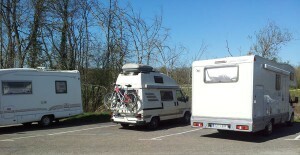 At least how it seemed until we happened upon a dedicated parking lot for camper vans just out of the town centre. It was free and quiet and much more convenient than random city parking. Again here we noticed that almost all of the other campers were larger, luxury models, being driven by 50+ French couples. The municipal campsite in Saumar. Not bad. In St. Malo all of the parking anywhere near the old town was kitted out with height-restricted access gates. As a result I ended up accidentally actually driving into the old town, with it’s narrow, semi-pedestrian, cobbled streets and a one-way system designed to keep you in the old town for the maximum possible length of time. Fortunately we broke the code, escaped the labyrinth and parked about 2km away in a residential street. At Mont St. Michel all of the public parking was barred to campers and there was literally nowhere, not a single space, which we could legally park in within an hour’s walk of the mount. No exaggeration. In the end we parked in the private lot in front of a restaurant for want of any other choice and even then it was a 45 minute walk on foot. To sum it up: we’re very much part of the mainstream in France, and the only vaguely unusual thing about Camperissimo is that it’s slightly smaller, older and shitter than any other van we’ve seen. Although our itinerary may differ at least in part from the average, our means of travel does not. So what effect has this had on the first week of this year’s trip? Mostly a positive one. We’ve slept better in the knowledge that we draw no attention, and about half of the nights so far we’ve stayed in municipal campsites, which are clean, centrally located and so cheap they may as well be free. The sense of freedom of being able to park anywhere and make that place your home for a night is exhilirating as an idea, but worrying you may stick out and draw unwanted attention can be mentally exhausting and ruin a good night’s sleep. That said, we’re both very glad to be travelling in the off-season, because taking the same circumstances and doubling, or tripling, the number of vans on the road isn’t a very appealing thought. The risk of bad weather – which so far we’ve completely escaped – is far outweighed by the joy of having an entire museum to yourself … and knowing that wherever you stop at least one of the specially-marked and excellently equipped camper van parking spaces will be free. Getting the van ready for the Tour de France! This entry was posted in Camper Trip April 2012, Random Musings and tagged 2012, France, parking, thoughts, tourism. Bookmark the permalink.